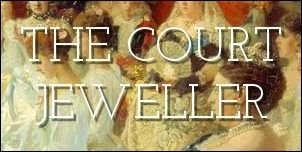 Today is German-American Day here in the USA, and since I'm one of the many Americans with German heritage, I thought we'd celebrate here by looking at one of the most interesting tiaras to come from nineteenth-century Germany: the seed pearl tiara that belonged to Grand Duchess Stéphanie of Baden. The tiara was first owned by a royal with serious connections: Stéphanie de Beauharnais, a relative of Empress Joséphine of France. Joséphine’s second husband, Napoleon Bonaparte, was especially fond of Stéphanie; he made her a member of the imperial family and engineered her marriage to the future Grand Duke of Baden. The tiara was made around 1830, after Stéphanie had been widowed. It is set with diamonds and pearls in yellow gold, and it was originally worn on the top of the head. 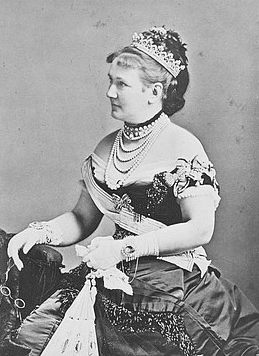 On her death in 1860, Stéphanie bequeathed the tiara to her granddaughter, Crown Princess Carola of Saxony. 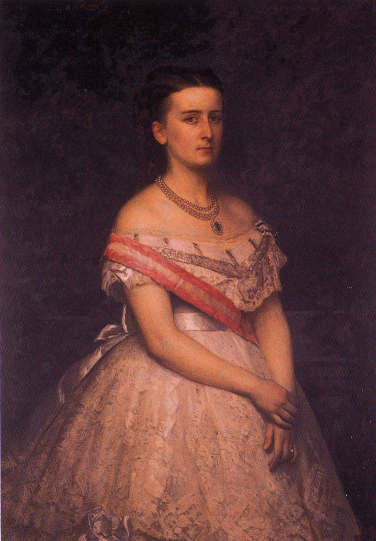 Carola was the only daughter of Stéphanie's eldest daughter, Princess Louise Amelie of Baden, and the deposed Crown Prince Gustaf Adolf of Sweden. Carola had married the Crown Prince Albert of Saxony in 1853; they succeeded to the Saxon throne in 1873, but they never had children, so when she died in 1907, Carola left the tiara to her first cousin, Princess Marie of Hohenzollern-Sigmaringen. When Marie died in 1912, the tiara remained with the Belgian royals. Twelve years later, it was given to her granddaughter, Princess Marie José, on the occasion of the princess’s first court ball. At this point the tiara was altered to be worn as a bandeau. Most of the time, a separate frame is required for a tiara to be worn as a bandeau. Sometimes two frames exist — for example, the Strathmore Rose has two — but other times, the frame itself is altered so that it can be worn as a bandeau (or transformed from bandeau to traditional tiara). This tiara was lengthened to allow it to be worn across the forehead. 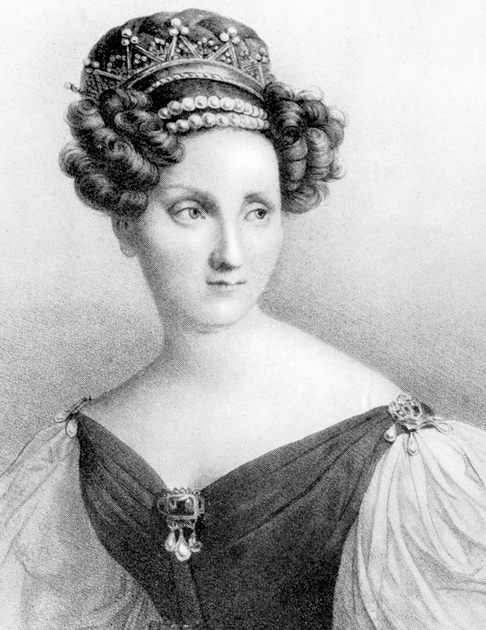 The seed pearl tiara was the very first diadem that Marie José ever wore. When Marie José married into the Italian royal family in 1930, her jewel collection expanded significantly. She wore the family’s imposing Musy tiara at her wedding, and that piece became the one that she was most associated with during her lifetime (including during the month that she was Italy’s queen). But she still kept the seed pearl tiara, and after her death in 2001, it was inherited by her daughter, Princess Maria Gabriella of Savoy. In 2007, Maria Gabriella decided to sell many of her mother’s jewels, including the seed pearl tiara. The German state of Baden-Württemberg, which includes the former grand duchy of Baden, splashed out more than $85,000 to purchase their former grand duchess’s tiara auction. Today, the tiara is a part of the permanent collection on display at Schloss Mannheim, which was once the home of Grand Duchess Stéphanie.